Welcome to A Sampling Bee! 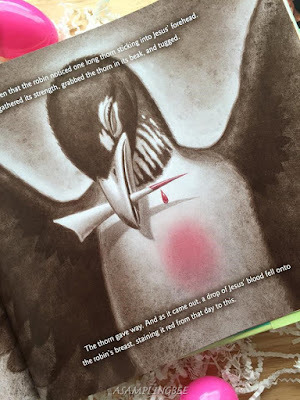 Today, I share with you a book called The Legend of the Easter Robin- An Easter Story of Compassion and Faith. 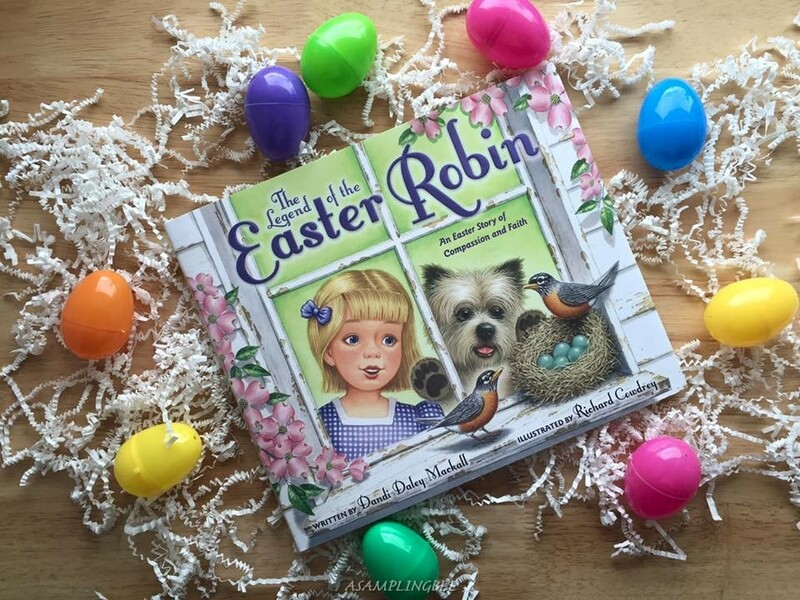 This newly illustrated edition of The Legend of the Easter Robin renews the wonder and charm of the original and timeless tale written by Dandi Daley Mackall. With new vibrant artwork from New York Times bestselling author, Richard Cowdrey, this holiday classic is brought to life for a new generation. 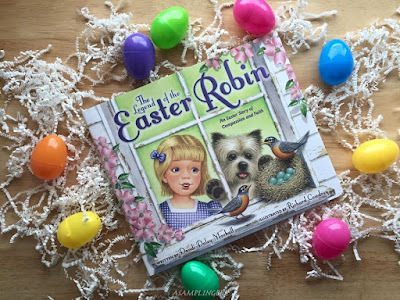 The Legend of the Easter Robin tells the story of Tressa, whose grandmother reveals to her the story of a small robin who saw Jesus struggling and soared to help him. The Easter Tale reminds Christians everywhere how much Jesus sacrificed for is and how much he loves us. In the center of the nest lay one perfect egg, the color of a spring sky. The father robin sat on a branch nearby, guarding his family. Tressa spotted raccoon tracks below and a blue jay eyeing the nest. "Gran, how are we going to keep the egg safe?" "We'll have to leave that one to the Creator," Gran said. Robins have built a nest on the window ledge at Grandmother's house! Tressa is thrilled-and concerned. 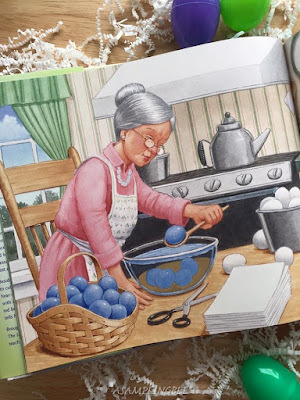 What will happen to the sky-blue egg laid by the mother robin? As more eggs appear, Tressa witnesses the daily drama of the robins' nest and learns how God cares for all creatures. Besides watching the birds, there are Easter eggs to color. Ant there is a very special story to hear-a tale of long ago about one small bird with a very big heart. How did the robin get its red breast? Tressa is about to find out as Gran tells her the story of the Easter robin. Brought to life with colorful, tender illustrations, The Legend of the Easter Robin will capture and teach your child about compassion and faith. This hardcover book is 32 pages long and is full of color and wonder. The Legend of the Easter Robin taught my sons as to how the robin got its red breast. This is a great book to read to your children around the time of Easter to remind them as to why we celebrate Easter. Seeing Tressa coloring Easter eggs shows us that it's okay for us to have our own Easter traditions. At the end of the book, the author shares with us a more detailed version of the old Pennsylvania Dutch Tale. That sounds like such a cute book! I bet my little one would love it. Sounds like it would be a great book for kids. Never heard of this book before I'll have to look into it more. Children's books are always delightful, they always teach the kids a lesson or a story that's relevant in life. I love the concept of this one. Easter is such a beautiful occasion and it would be nice if kids learned about it early. That is such a cute book. I bet the illustrations are adorable too. This looks like a great book! The illustrations are absolutely gorgeous, too! It's the perfect book for this time of year! I think my granddaughter would love it. That would be a good book to read for Easter tolittle opnes. We have a smilar book like that at home. I'm sure my nephew would love this book, he also would love those pictures. Great book for my kids. Will check it if we can buy it here. This sounds like a really cute book. I'm sure my kids would like it. Definitely a great idea to add to the Easter basket. Such a fun book! I'll have to get one for my niece she would love this. Perfect for her gift basket. Sounds like a great story. I will have to look for it for my kids. The illustration in this book is wonderful and it sounds like something my daughter would love.